Spring has finally arrived here in Michigan. The Bradford Pears are blooming along the city streets and golf courses, the rhododendrons are fuchsia-bright, our neighbor's massive tulip bed is all reds and yellows, and the magnolia tree in our front yard is blessing us with its short-lived but beautiful pink blossoms. The lilac in the back is starting to bud, and all the crabapples will soon be dotting the landscape with their profusions of tiny pink flowers. A pretty handmade card, sent by a dear blog friend. I have a pot of cheerful yellow primroses on my porch, and the woods behind our house, for so many months brown and barren, are leafing out, bright green and filled with birdsong. While the outside world is covering itself in glory, I'm trying to do my part indoors. A few pics from last week's Easter celebration. We had lamb kebabs with pita bread, salads, veggies, lemon pie, and chocolate cake. I made tzatziki sauce and hummus. Since I am allergic to tahini, one of the main ingredients in hummus, I made this hummus without it. Not as good as the regular, but a welcome substitute for me. So, I've been trying to do a little spring cleaning. I sorted through and got rid of about eight inches of paper work from a file cabinet drawer I could barely stuff one more receipt in. And my knitting projects have been totally disorganized. 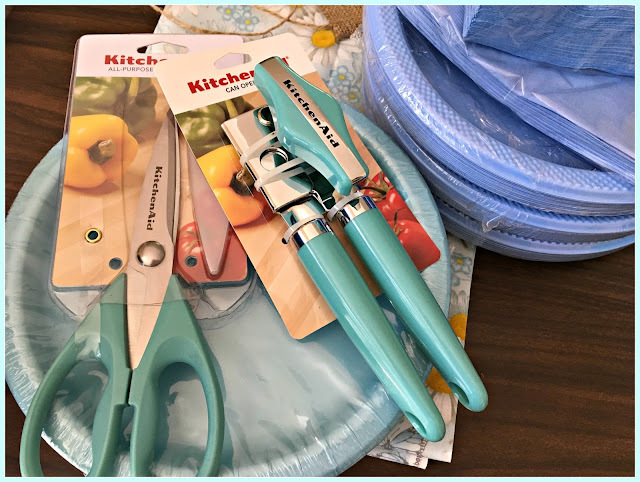 I showed up to knitting class last week, two large bags stuffed with knitting supplies, but missing some instructions and having to borrow a needle and stitch holder from the teacher. I felt like an errant school child who has come without her homework. So I got that all squared away, and discovered I have nine ongoing projects. Hmm, better get busy. I finally made some order out of my sewing/craft room that was my daughter's room up until this past September when she got married. It had become a dumping ground for all my projects, craft supplies, writing projects, and photographs. I still have lots of sorting to do but everything is neat and organized, and at least in boxes/on shelves. My Project 333 closet. Oh my goodness. It's more like Project 666 at this point!! My closet has never been such a mess. I really have to have a good sort through/clean out soon. 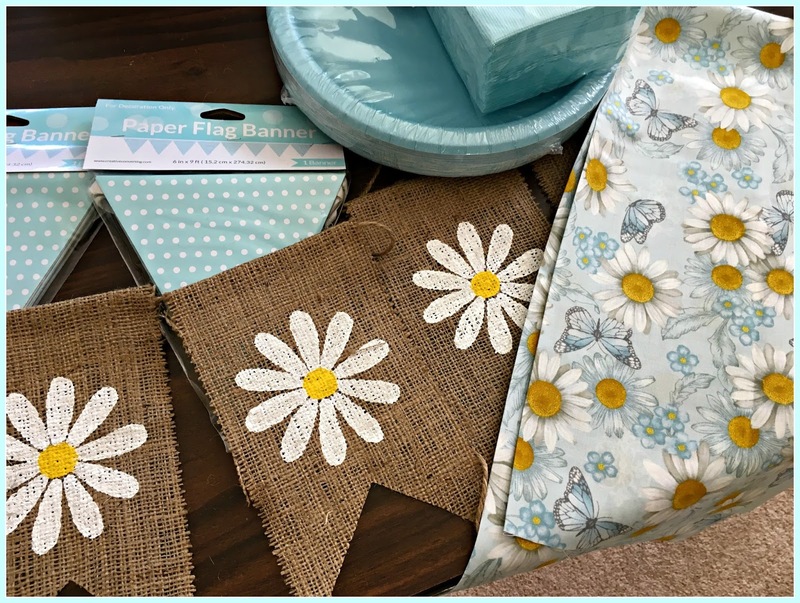 In the meantime, my book club is planning a bridal shower for one of our member's future daughter-in-law, and I am thinking decor. The bride-to-be likes blue and daisies. And she had been considering a barn wedding, so I thought she might like a rustic touch. So I got busy on etsy. I love etsy. I could spend hours -- and I usually do -- browsing all the fun and unique items there. I'm not sure what to do with this fabric. I might cut it into triangles for a banner or tear it into strips to decorate a banner, not sure yet. 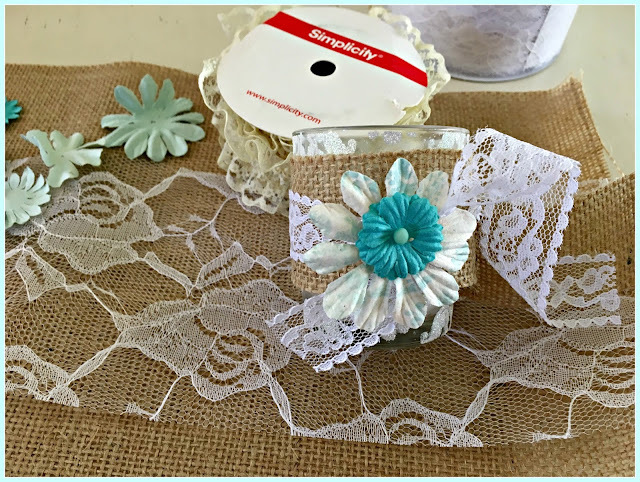 But it ties together the burlap and lace and daisy theme with the blue napkins and plates. 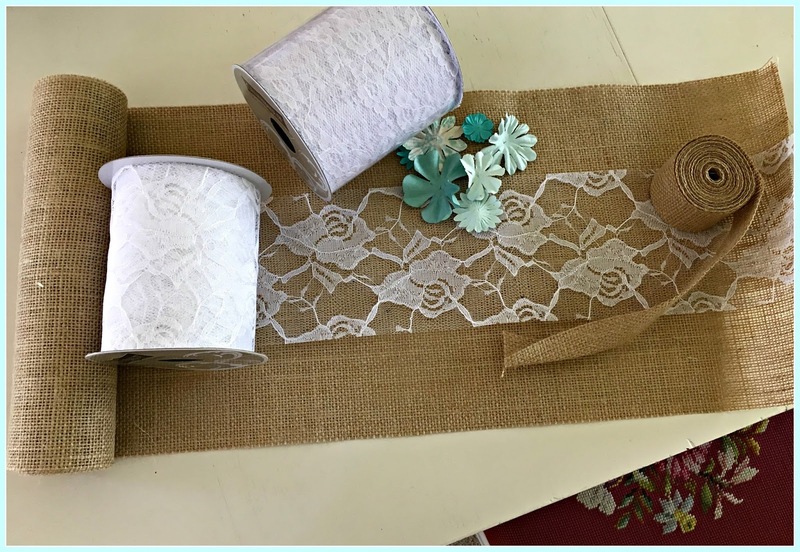 I'll cover the tables with white tablecloths and lay burlap runners with lace overlays. Another book club member is bringing canning jars filled with daisies for centerpieces. We gave a romantic pink-and-tea-themed bridal shower in January and I still have the votive candle holders that we used. 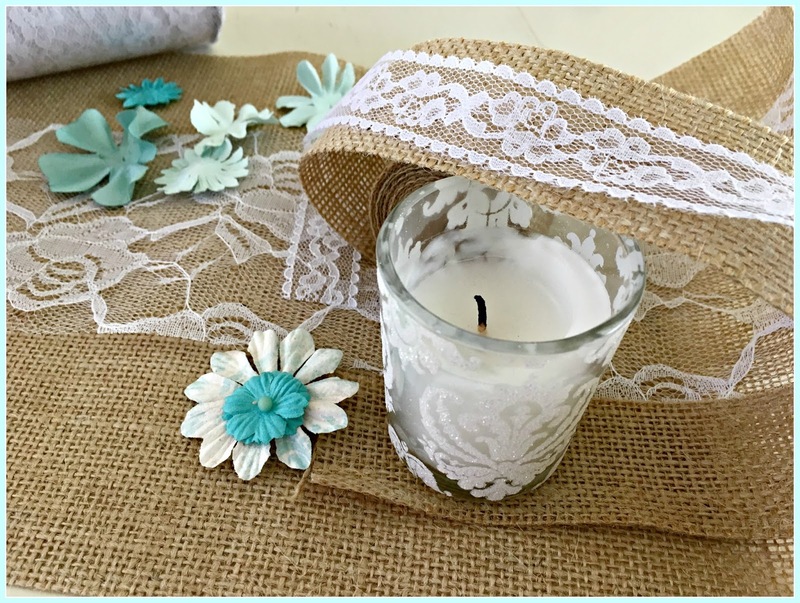 So I thought to cover the candles with burlap strips and lace and hot glue these little blue flowers on the sides. I got the plates on the right, and then worried they might be the wrong color. I was afraid it might look like a baby shower. So then I got the plates on the left. Oh, dear. Now what? The plates on the right really do look better with the fabric, but should I forget the fabric? Well, this is all so much more fun than the traditional spring cleaning of scrubbing and polishing and mopping. I will get myself over to the laundromat soon though and wash my winter comforters to put away and replace with my summer bedspreads. But really, the creative pursuits always seem to take precedent. After this shower, I'll be thinking about my niece's wedding in July. The last bridal shower we did I had decorated a Christmas tree that was still up with pink roses and eucalyptus. 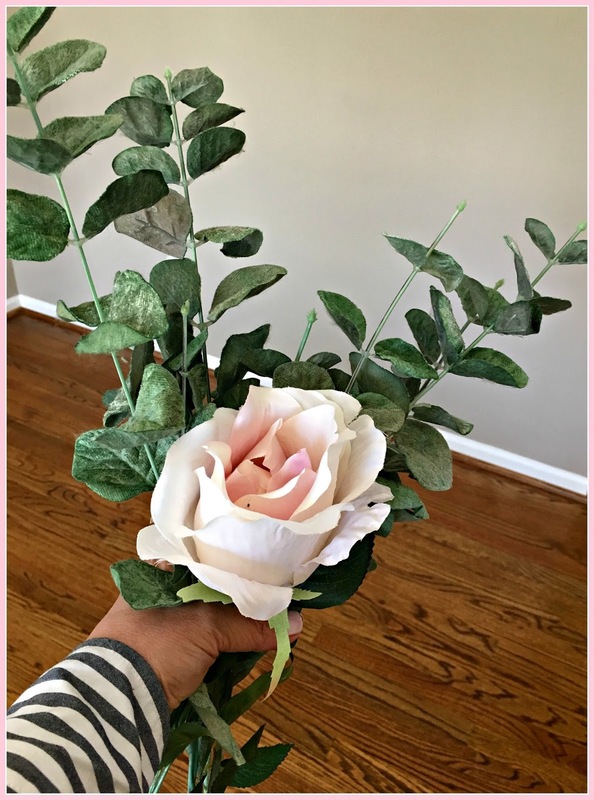 My niece was looking for something to decorate the end chairs lining the aisle at her outdoor wedding so I sent her this pic of the rose and eucalyptus and asked if she wanted me to do something with them. She liked the idea, so I will put something together using either satin ribbon or tulle, and maybe experiment adding a little bling or trailing ivy with it. My husband is outside today doing some heavy-duty yard work. I think he was hoping I would help, but I hurt my back moving furniture just before we were to get started. Ahem. Not on purpose. 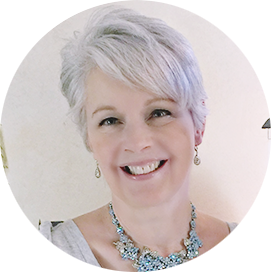 But now I can sit here quietly with a pillow behind my back and work on my blog and visit blog friends. Hope you're all enjoying your Spring. OOH...so many lovely things to comment on here! You are a phenomenal decorator, my friend! 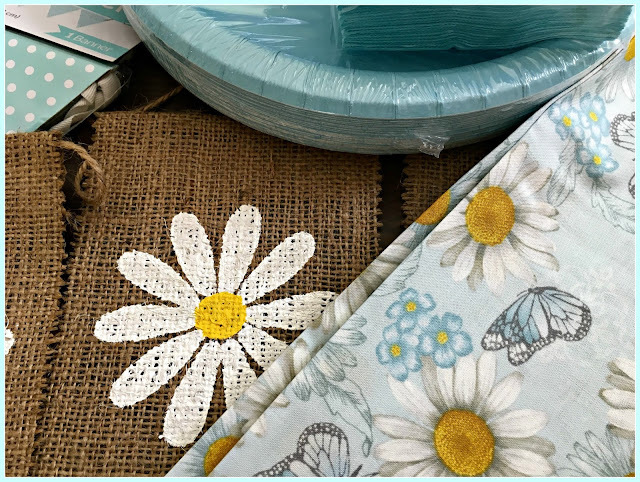 Your Easter tables are absolutely gorgeous ...those pink tulips are to die for!, And I love what you picked out to decorate the shower with...the brown burlap and that delicate aqua-ish blue in combination with the daisies is perfect together. Playing in decor is always more fun than sweeping and mopping in my book! Have a great week ahead, Deborah! I would feel very special sitting at your Easter table. Beautiful! As to your shower plans--I really like the theme and colors. Cute, cute candle holders. I would much rather work on that wonderful stuff than spring cleaning! Well, you have been one busy woman and I love your Easter tablescapes, so lovely! And, your projects are lovely. Have yourself a wonderful new week! I think you are feeling that spring in your step, Deborah! Good for you in getting organized. It can ebb and flow. It is usually spur of the moment for me...I get tired of stuffing sheets in the linen closet so I overhaul it. I can't find something in my purse so I jump it out and get it in order. Planning projects just sometimes don't happen or me! 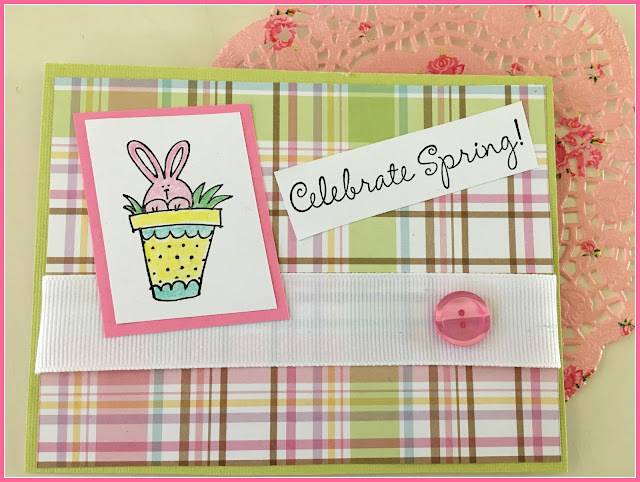 Your Easter place settings and menu sound lovely! I've never made lamb and the kebobs sound fantastic! I think the daisy themed wedding is wonderful. I really like the fabric and if I can say, I'd choose it over the napkins. 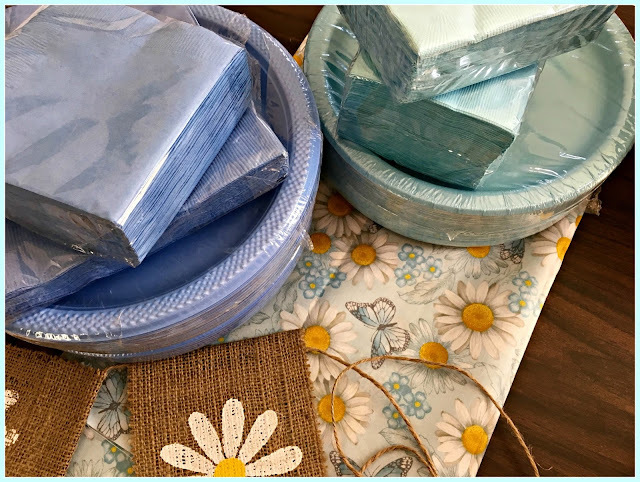 Paper goods never go to waste and you might just stumble on the perfect shade of blue. Maybe Google some of the large party supply stores? Good luck, you're so creative and I know you will come up with something great. I hope your back feels better. I have the sort of back problem where it simply slides out of place with no real incident. And then I'm immobile until the inflammation goes down. I always thought it was an exaggeration that we start to go downhill in middle age as far as health, but I'm learning every day that we do, often without warning!! Have a good week and feel better. What a joy to visit and see your beautiful Easter table décor and the lovely ideas that you have for the wedding shower. My home is chaotic to say the least at the moment we are living in box paradise. Sadly Spring has not reached this little island yet. As I sit here typing this I can see out of the window where the sleet is falling and the wind is blowing a gale. Yes, use that fabric - it's gorgeous! I would've voted for that robin egg blue over the other, even before I saw the bride's kitchen utensil color. You do such a great job with your decor, Deborah. I kept remembering your last shower when I was preparing for my niece's Tiffany shower in early March. You were actually an inspiration to go the extra distance in making things special for my niece. Our tulip magnolias in the neighborhood bloomed in February this year, then in March they were literally freeze-dried on the branches. It actually made for an easier clean up of the petals once they fell...they were crunchy, like fall leaves instead of moist petals. I love spring, and hearing about your northern region just makes it feel like a a great show's encore. Enjoy! Your tables look gorgeous...love the beautiful tulips! And I'll need to get back to working in closets when it's too hot to be outside! I have a lot to do to sort through shoes and purses I don't use any more. Have a beautiful week! Hugs! Wow Deborah, your tables set for Easter are beautiful! Tulips are so pretty and so springy! I made little baskets for everyone too! I have to say that I have one of those closets too and I bet it beats yours though I have been working on it a little at a time! It's so overwhelming but I decided to tackle a little each week, box it up and get it out of the house! The first week my husband took 3 large bags to the Planet Aid box! I suspect there are many more bags to export! What fun decorations for the shower! I love the daisy theme! So sweet! Have fun with it! 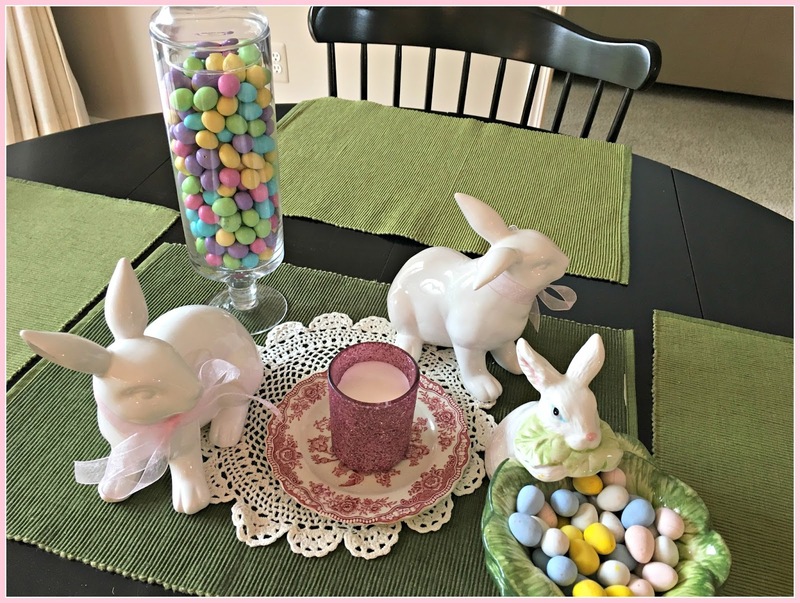 I absolutely loved your Easter table! The favors on the plates were so cute! Were they cupcake holders? I couldn't tell from the photos. As for the shower decor...It is amazing! My favorite color is that light aqua and everything will look beautiful I am sure! Wow! you sure have been busy. I was a bit disappointed this year in my Easter table. Frankly, I was not really into it. My daughter and family went to Florida and so there was only my sister and her two kids, my husband and son, and a friend of ours who had no place to have dinner. So, I did not put forth much effort in my Easter decor...my own fault. I am trying to start my Spring cleaning, but I can only do bits at a time and then i get distracted!! Anyway, your post was really a happy one and it made me feel like I want to get moving around here also! Project 666...hahahhahaha... well, I do love the color combinations for the bride-to-be's bridal shower...very pretty. Hope that your back is soon feeling better. You don't want to miss out on all the fun of yardwork. I'm so happy spring has reached you now, Deborah. The one thing that comes to my mind every morning when I open the door and look out is, "This is my Father's world...." What a lovely thing spring is. And so were your Easter tables! And your dinner too. I hope that back gets better soon as it sounds as if you have lots of lovely things to look forward to. You are such an inspiration! I think you put on the loveliest showers. they are so pretty and make my utilitarian ones look positively bland and boring! Hi Deborah, your home looked so pretty for Easter. I love your tables. So springy and uplifting. So glad to read that spring is finally in Michigan and the blooms giving a pretty show. The shower planning looks like fun and the theme color and decor is perfect. It will be beautiful with your touch. Well wishes for your back. Rest and take care. Your Easter table was pretty Deborah. What a delight to visit today. Loved to hear about your spring cleaning projects. I don't know how those 'piles' get that way over winter, but it sure feels good to sort it all out. And you're showing planning is well underway and it all looks so sprightly and alive with joy. 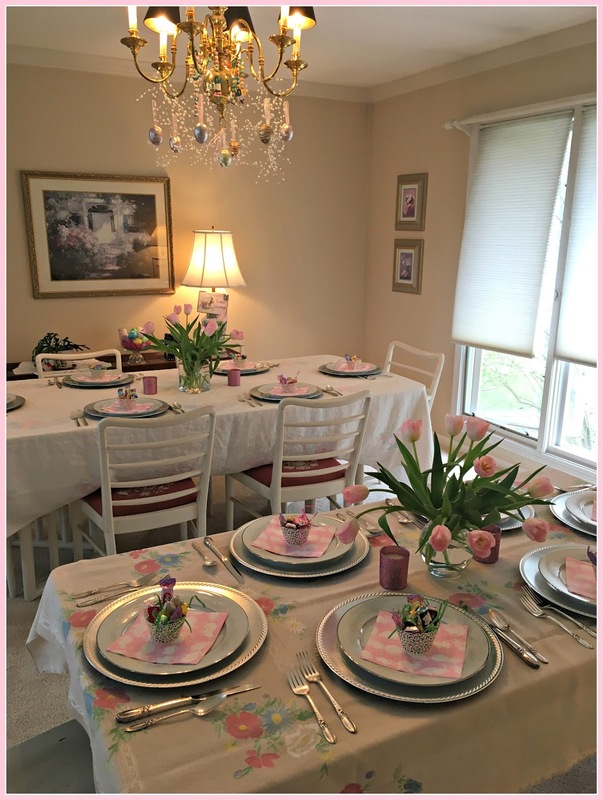 Your Easter tables looked very festive and inviting. First, I am so sorry you hurt your back! I hope you can be very kind to it and that you'll feel much better soon. Your Easter table was beautiful and I can't believe how much farther ahead spring is in your neck of the woods. Only daffodils in my garden and not an apple blossom in sight. 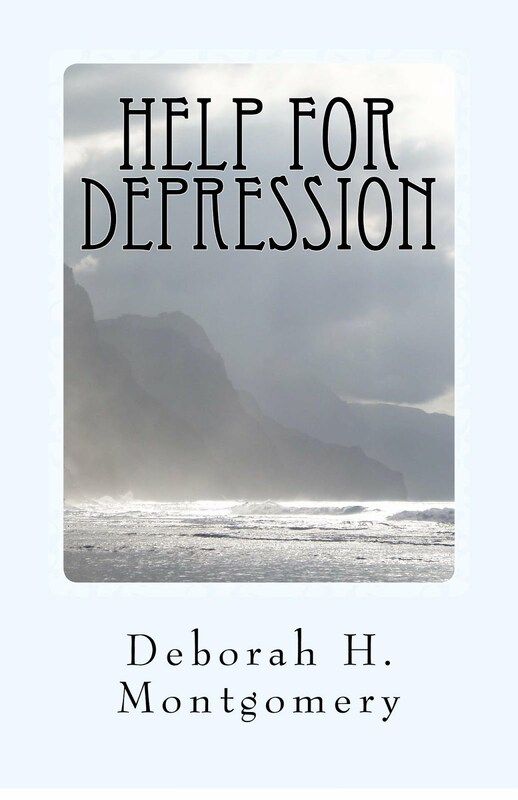 Oh dearest Deborah, take care with your back, as you have so many fun projects to work on. I love the colors for the shower and yes, the kitchen tools look perfect with the plates. Your Easter tables looked so pretty and your menu sounded wonderful. I know that you're happy to see Spring arrive in Michigan! Love and hugs are sent to you, my friend. Hope your back has healed by now. 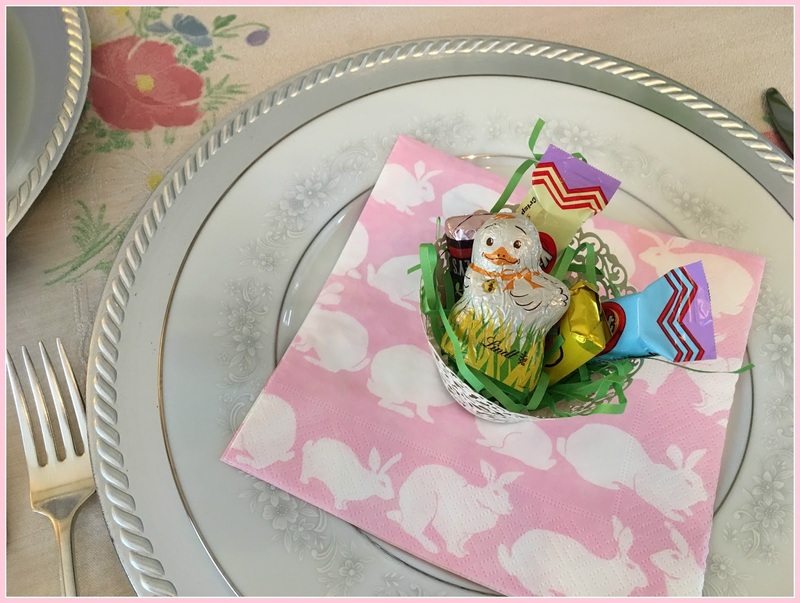 What a charming Easter table settings! 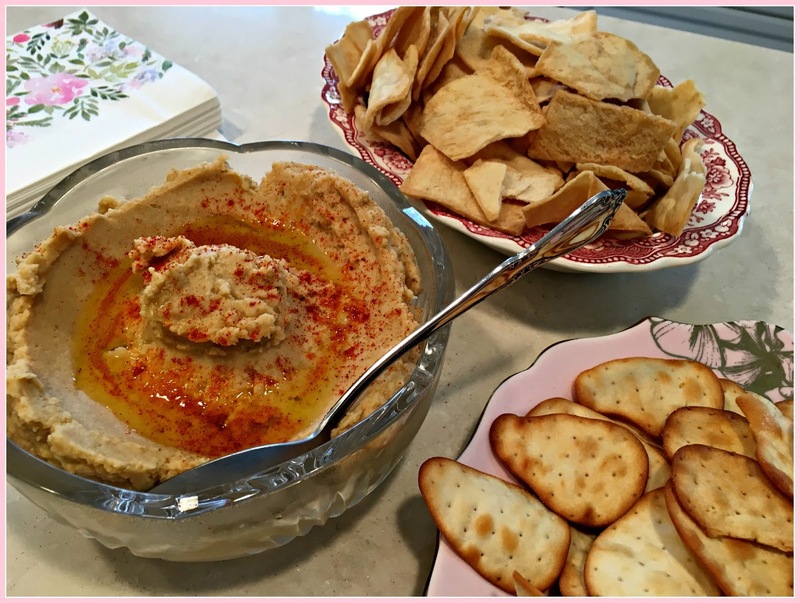 I have a craving for hummus after reading your delicious Easter menu. I'm loving the blue shade (robin's egg? Tiffany blue?) for the bridal shower. My filing cabinet is also in desperate need of decluttering. I'm so sorry you hurt your back. I hope you feel better soon. I'm tired just READING about all you have done/are doing!! 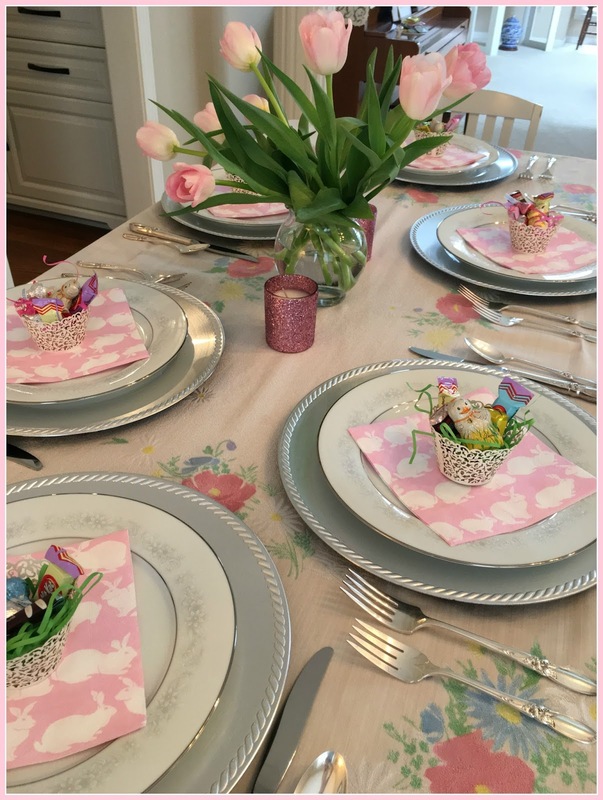 Your Easter tables were magnificent -- so very pretty! I love this time of year too -- here in Chicago the lilacs are in full bloom and I've had vases of them all over the house for days now! The daisy shower looks like it's going to be beautiful as well -- love the colors! Hey There, Well firstly, take care of your back, your gonna need it! And your closet is well yours, I can assure you the clothes police will not do a house check! You always decorate your parties with such class!! And the Knitting class episode left me cracking up! Beautiful! 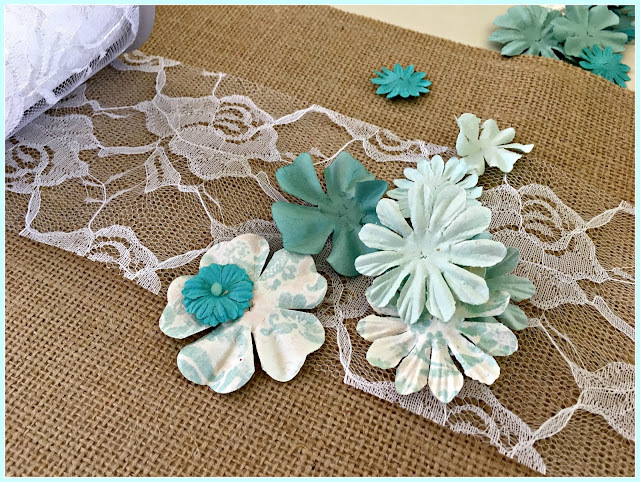 From your Easter decorating to your lovely colored bridal shower to the rose and eucalyptus. That bridal shower is going to be quite lovely, Deborah. Sounds like you are surrounded with spring beauty in your area. Take care, and feel better soon. A lovely post, love what you are doing with the burlap and lace, and of course the turquoise colors are my favorite! 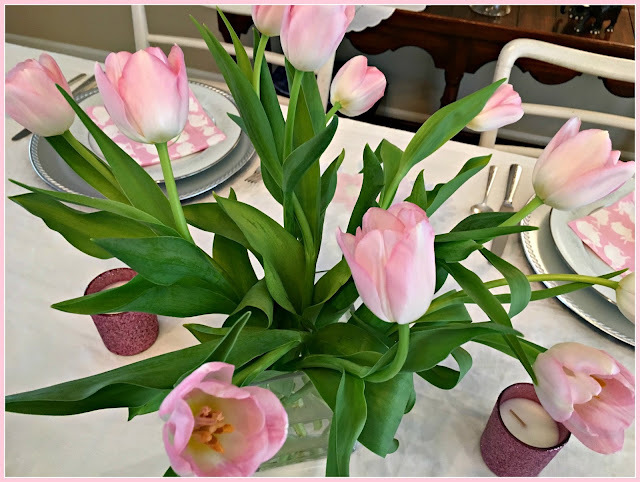 Your Easter table was beautiful too, love those tulips! I hope you have had a lovely spring, all those spring flowers blooming sounds wonderful! Our flowers are getting ready to bloom here, but not quite... we can't wait for the blooms to come!